Valhalla, N.Y., June 25, 2012 (EMBARGO UNTIL 10:00 PM ET) – FUJIFILM North America Corporation today announced plans to offer an expanded selection of FUJINON XF lenses for the FUJIFILM X-Pro1 Interchangeable Lens Digital Camera System that will offer a wide range of new shooting opportunities for professional and advanced photographers. From super wide single length focus to telephoto lenses, users will now be able to freely choose which XF lenses match their shooting style, and allow them to experience the extraordinary image quality of the FUJIFILM X-Pro1 in a variety of new ways. Beginning in the fall of 2012, Fujifilm will introduce two new bright and fast aperture prime FUJINON XF lenses: the XF14mm (21mm) F2.8 single focal length lens and the XF18mm-55mm (27-84mm) F2.8-F4 lens. Each of the new XF lenses are designed to deliver sharp, clear images of unmatched quality with precise aperture control, and beautiful bokeh effects thanks to the design of the molded aperture diaphragm blades. The blades are curved to create a circular image at all aperture settings, while the very edges of each blade are meticulously rounded off rather than cut off, to deliver more pleasing images. 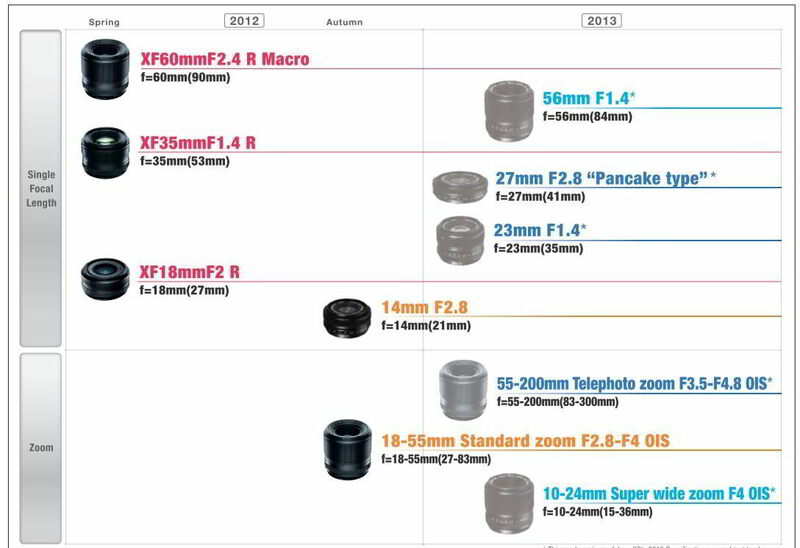 Then in early 2013, Fujifilm will also deliver three more high performance single focal length lenses that include the XF56mm (84mm) F1.4 lens, the pancake XF27mm (41mm) F2.8 lens and the XF23mm (35mm) F1.4 lens. Then in middle 2013, Fujifilm will launch a telephoto XF55mm-200mm (83-300mm) F3.5-F4.8 lens and the super wide zoom XF10mm-24mm (15-36mm) F4 lens, both with optical image stabilization. The award-winning FUJIFILM X-Pro1 digital camera features a custom-developed 16MP APS-C X-Trans CMOS sensorTM that incorporates a newly developed filter array and Fujifilm’s proprietary EXR Processor technology. The FUJIFILM X-Pro1 delivers superlative image quality that rivals currently available mid and high-end DSLR models. The FUJIFILM X-Pro1 also features the unmatched 2nd Generation Hybrid Multi Viewfinder, a gorgeous magnesium alloy chassis, and an improved user interface for easy and intuitive operation. Next story Fujifilm X100 discontinued, making way for the X200?